Around the tenth century, we hear the venerable St. Simeon the New Theologian explaining that many illnesses are caused by a disorderly and irregular diet. Does a saint speaking to us one thousand years ago have answers for our food choices today in the world of egg beaters, diet sodas, and fat-free foods? 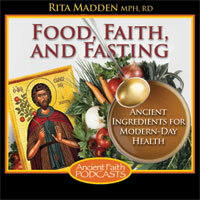 Welcome to another edition of Food, Faith, and Fasting. Last time we met, we were talking about the importance of eating in a spiritually-minded manner. We were returning to being more mindful of why we are eating, the act of eating. We were reminding ourselves about the importance of prayers before and after a meal. This time we are going to continue to build upon this act of spiritual eating and focus on how we nourish the body to serve as an aid to the soul—“true, proper nourishment that our bodies need to be healthy, to prevent chronic diseases, to manage diseases if we have them, such as diabetes and high cholesterol, to help us in weight loss, that can help with bringing down our cholesterol levels, bringing down or blood pressure levels, helping with blood sugar control. Sensible weight loss, healthy weight loss. What does that look like? What should we be eating? I know it is confusing. There are so many mixed messages out there about what we should be putting in our mouths. Like we said, we hear carbs are bad, so there are 14 different low-carb diets that we can do. We hear that fat is bad, and so fat-free is very much promoted. There is fat-free this, and fat-free that. Today we are going to try to simplify this process of what, really, we should be eating. Around the tenth century, the venerable Saint Simeon, the New Theologian, in lots of his writings, explained that many illnesses are frequently caused by a disorderly and irregular diet. In the tenth century he was talking about the fact that so many conditions are caused by food choices and the way we utilize foods. There is wisdom from so many years ago that is very relevant today. What are we hearing all the time? We have to change our diet. You go visit the doctor, the doctor tells you that your cholesterol is high, and tells you to go home and work on that. It is related to your diet. It is related to your lifestyle. So there are things that we can do. If you were with us at the last podcast, you noticed that I brought up a teaching from Saint Seraphim of Sarov, in which he emphasized that every day one should partake of just enough food to permit the body being fortified to be a helper and friend to the soul in performing the virtues. Otherwise, the body exhausted, the soul may also weaken. We also see Saint Seraphim of Sarov talking about the importance of fortifying the body. I want everyone to think about this concept. We have Western medicine telling us that the less amount of medications we can be on, the better. We hear that if you can make some lifestyle changes to get off your blood pressure medication, that is great, because if you get off your blood pressure medication that is one less medication that is taxing on your liver. There is a time and place for medications, but if we can make lifestyle changes, that is great, because then we can be off some medications, and that is beneficial to our liver, because we know that synthetic medications, even though they can be good, can be very taxing and hard on our liver. I want us to think about something. We have so many different foods out in our market today, and so many of our foods are loaded up with synthetics, additives, preservatives, artificial flavors, artificial colors, all sorts of man-created synthetic items. We have bread that can stay on our counters for a good month, without even having a speck of mold develop on it. The reason is that there are a lot of preservatives in them that are keeping that bread in that condition. But our bodies don’t recognize these preservatives, so when we ingest the food, I view it as being very taxing on the liver. These synthetic additives and preservatives that are put in our foods can have a detrimental role in our health and wellness. To look at this concept of fortifying our bodies, and to look at the teachings of Saint Simeon, the New Theologian, in regard to illnesses frequently being born from a disorderly or irregular diet, the first thing that we need to recognize is that many of these foods in our markets today are not coming from foods that God created. They are being synthetically made in a lab, and those, essentially, we can term as being part of an irregular and disorderly diet. We can also recognize that these foods are not necessarily fortifying our bodies, but are hard on our bodies. How are we going to simplify this? He is an assignment I am going to give you to practice. I want you to take your food label and I want you to turn it upside down. We spend so much time in our nutrition-conscious way of eating today, focusing on the fat, the carbs, the protein. Don’t worry about that. We are going to handle all that by choosing the right foods, in the right balance, and we will continue to work on that as we move through these podcasts. What I want you to do from now on is to turn the food label upside down. What I mean by that is to use the ingredient list, as opposed to the part of the food label that contains the fat, calories and protein. As I said, we will handle all that when we move into portion control and everything of that sort. But I want you to read the ingredient list. If the ingredient list sounds like a chemistry project, if you cannot pronounce half the things on the list, if that list is longer than your thumb, I want you to think about choosing another food. I want you to start by looking at your ingredient list, and if you see just one of these five ingredients, try to remove that food and replace it with something else. The first one I want you to look for i high-fructose corn syrup. The second one I want you to look for is partially-hydrogenated oils, and when I say partially-hydrogenated oils, I mean any kind of oil, whether it be partially-hydrogenated soybean oil, or partially-hydrogenated cottonseed oil. The key is to remove a food from your diet if the ingredient list contains partially-hydrogenated oil. The next one I want you to look at is Aspartame, or Sucralose. These are artificial sweeteners that need to be removed from your diet, and I will explain why in a few moments. Next, I want you to look for food dyes, and I want you to look for the ones that begin like this: Red dye 40, yellow lake 5, blue dye 1. If it begins with the name of a color, these are the major ones I want you to focus on removing from your diet. For example, you might see on a block of cheese, annatto, and then in parentheses it says, added for color. That is okay. That comes from a seed that is crushed up and made into a powder. It is a very, very common seed that you see growing in the fruits of plants in the Philippines. Annatto, for example, is one coloring that you can keep in your diet. But the ones that begin with the actual color names are the ones that I want you to remove. Finally, I want you to remove monosodium glutamate. Let me review those one more time, because these are going to shape our new approach to looking at a food label: High-fructose corn syrup, partially-hydrogenated oils, Aspartame, Sucralose (also known as Splenda), the food dyes whose names begin with a color like yellow, red, blue or green, and finally, monosodium glutamate. We are going to start there. If you start by cutting out these major additives and preservatives that are seen in a lot of our foods, you are going to get out a whole host of other ones without even thinking about it. Why is that important? Why am I encouraging you to get these fake food ingredients out of your diet? High-fructose corn syrup is put in a lot of the foods right now because it is cheaper than sugar, it also works as a preservative, and it also is in a lot foods to make foods taste sweeter. The reason is that they take the fat out of a food, they have to make the food taste half-decent, so they throw in a bunch of sugar, and they choose to use high-fructose corn syrup because, again, it is cheaper than sugar, it works as a preservative, and it is making the food taste okay after the fat is taken out of it. The reason it is important to get high-fructose corn syrup out of your diet is because it is very hard on your body to process. It causes your body to be taxed with over-production of insulin, which can lead to type 2 diabetes, which we are trying to prevent. You are going to notice it is in everything. But if you go to the store it’s not like you can buy a tub of high-fructose corn syrup to bring home and do your baking. What can you buy? You can buy honey to put in your tea. You can buy brown sugar, sugar in the raw, or white sugar, to make your cookies. And when you cut out the high-fructose corn syrup, you are cutting out a lot of processed foods. You are returning to eating the foods that God made, that God gave us. Partially-hydrogenated oils have been shown to have a bad effect on our cholesterol levels. They have been shown to start clogging the arteries a lot faster than other food substances. Partially-hydrogenated oils are being taken out of a lot of foods now because its detriment to our bodies is being recognized, but it is still in many of them, because it also works as a preservative. It gives those foods a long shelf life, so you can buy a box of crackers and eat them five years later because they contain partially-hydrogenated oils. But that is not fortifying our bodies, and that is considered to be something of an irregular diet. It is not a food that God created. I want to speak a little bit about Aspartame, because a lot of times when people have diabetes they are told to drink diet soda instead of regular soda. My answer to that is, don’t drink either of them. Neither of them are made with real ingredients. Back in the day they used to have soda parlors. People would walk up, have a soda, and it was made with real sugar, and they had soda in the proper context, every once in a while, as a treat, as a food that was part of a celebration. Now what do we see? It is a standard drink that people are having with every meal. But your body doesn’t recognize Aspartame as a normal sugar. Aspartame, the artificial sweetener, is 200 times sweeter than sugar. Even when I work with a diabetic, and I am trying to get them to manage their blood sugars, I still incorporate the use of regular sugar, honey, maple syrup. That is still a part of their diet plan. I don’t tell them to go start eating this artificial stuff, because it is so hard on the body. They are noticing that there are over 30 different symptoms that are associated with the consumption of Aspartame. I worked with a woman who was drinking a couple of diet sodas a day and she was getting migraine headaches like you would not believe. We made the correlation that her migraine headaches were caused by drinking the diet soda that contained the Aspartame. She cut out the diet soda and the headaches went away. She didn’t need to be put on a medication for a migraine, she needed to remove a fake food from her diet that was causing the migraines. The food dyes, red dye 40, blue dyes, yellow lake 5, whatever they might be, have, on a large scale level, been banned, are not even allowed to be used, in many areas of Europe. They are recognizing that there is a link between food dye consumption and hyperactivity disorder. Also, there are a lot of research studies that have shown that a lot of these food dyes are cancer-causing agents. Now we are starting to take a little bit more of a look at something like Gatorade that is this bright color, or maybe Kool-Aid that is this color that is not even found anywhere in nature, that could be a reason we are seeing a lot of these new conditions. So I want you to focus on also removing the food dyes from your diets. We are taking care of our body so that it can be an aid and a helper to our soul. Start by cutting out those ingredients that I mentioned. Use your food label. Get out that magnifying glass, read through it, and if you see any of these, remove that food from your diet. That is the assignment for the week. I was reading the monachos.net blog recently. It was very interesting because there was a discussion taking place with the head cook, Mother Euphrosynia, from a monastery in France. The discussion taking place was about eating, and she said something that was just so full of wisdom that I really want to share it here. She said that the meals that they have are balanced, nutritious, and tasty. What is interesting about that is that a lot of these fake ingredients that I am trying to get you to pull out of your diets, just the chemical design of some of them alone, make people crave more food. The more high-fructose corn syrup you eat, essentially, the more sugar that you eat, the more sugar that you crave. Because high-fructose corn syrup is in everything right now, if we start to cut back on eating foods with high-fructose corn syrup in them, we are going to notice that our taste and craving for sugar is just going to come down, because we are giving foods to our physiology that are not going to set up unhealthful cravings. It is the same with Aspartame. It has been shown in the research over, and over, and over again, that the more diet sodas someone drinks, the more sugars they crave through their day. It creates a false sweet tooth. It also causes people to snack more often. It is almost as if they are giving their body something that tastes sweet, but there no calories in it, so the body gets really confused. It is almost as if the body says, “Well gosh, I feel like I just ate, but I really didn’t.” So it goes looking for food in other areas. I am really simplifying these concepts, but what I am trying to bring to light here is that when we return to eating real foods, we feel satisfied for a longer period of time, because we are fortifying our bodies, like Seraphim of Sarov suggests to us to do, because now, every single thing we eat contains the vitamin A that our body needs, contains the protein that our body needs, contains the vitamin C that our body needs. A diet soda does not have anything in it that our body needs. But even if we are having a dessert, and the dessert is in its proper context, and we are controlling the portion size of it, as we will talk about as we move through these podcasts, even the dessert, let’s say it is ice cream, contains nutrients that our body can utilize. We are getting calcium out of that. We are getting perhaps some vitamin A out of that because of the eggs that were used. As you can see, when we return to real foods, we fortify the body. Again, it is all about consuming the right amount, which we will work on as we move through the sessions. But today I want to focus on returning to eating the foods that God created. Here is a helpful rule for you to follow concerning that. Let’s say if the food was around 400 years ago then that is an okay thing to eat. If you are going to eat bread, we know that flour has been around for centuries, yeast has been around for centuries, water has been around for centuries, sweeteners like honey and sugar have been around for centuries, oil has been around for centuries. If those are the ingredients that are making up your bread, that’s an okay bread to choose. If you look at an ingredient label on bread, and it contains 15 different preservatives and additives, those have not been around for years, so those should not be in your bread. Bread was meant to go bad in a few days if it is made up of real ingredients. If you are going to have a chocolate bar, and you see ingredients in it that have been around for quite some time, like cocoa powder, the cocoa bean has been around forever. Broccoli has been around forever. If you are having milk, cows have been around forever, and cows give us milk. We are focusing on choosing real foods, so if it was around 400 years ago, that’s an okay food to have. If the food is made up of a bunch of ingredients that have been around for that long, that’s an okay thing to have. The simple way to do this is to start by cutting out the ingredients that I have mentioned, and just returning to this idea of intuitive eating, eating real foods. Also, one more thing that I would like to emphasize in this session, because as I said, we are going to continue to build upon this as we move through these podcasts together, is that when we are eating real foods, they are going to keep us satisfied for a longer period of time. And because real foods are going to keep us satisfied for a longer period of time because they contain the nutrients that our bodies need, we can end up being satisfied with less. We are going to start getting a little bit into portion control, and we are going to talk about that in the next podcast to come. We are going to start to figure out how much food our body needs to be satisfied, but the balanced nutrition of a meal, like Mother Euphrosynia was pointing out to us, is important. The final thing is that she emphasized them being tasty. When food tastes good, we end up feeling satisfied. This is where this fat-free concept of food is difficult to embrace. God has put fat in food for a reason. Fat makes food palatable, and it has a nice consistency which creates a nice mouth-feel, so it makes the foods tasty. When foods are tasty, we can be satisfied with less, because we are turning to eating the real foods that contains the nutrients. The strategies on how we are going to be satisfied with less are going to come up in the next podcast. The thing to emphasize here, though, is that we hear all the time that if it tastes good, don’t put it in your mouth, that must mean it is unhealthy. But this is not true. It is about eating tasty foods in the proper context. So as we are framing our idea of spiritual eating, don’t think that foods have to taste bad. Another thing that Mother Euphrosynia emphasized is that we use spices when we cook to make foods taste good. That’s an important part of a balanced meal. And that tastiness of the meal is an okay thing. Diet soda doesn’t taste good. We have convinced ourselves that it tastes good. Fat-free yogurt isn’t necessarily how yogurt was intended to be. We eat all these sugar-free and fat-free things and what happens? We end up eating more because we feel like we get this get-out-of-jail-free card because everything is fat-free and sugar-free, so we end up actually eating more, as opposed to having the real deal that tastes really good and having less. It has been shown over, and over, and over again, that when people are choosing low-fat and fat-free throughout their day, they actually end up eating more calories because they don’t feel satisfied, because some of the nutrients, such as fat, are missing, and so they end up snacking more throughout the day. When we come to the next podcast we are going to recognize that when eating these real foods and controlling the amounts of them, we are going to be satisfied with less, and are going to have less cravings and snacking between mealtimes. Practice the assignments that are reviewed in today’s lecture. Look at your food labels in that concept, to return to eating foods that are going to fortify your body so they can be a helper to the soul, and move away from foods that are leading to eating a disorderly, irregular diet. Eating foods that by their chemical design are making us crave more foods is a disorderly or irregular diet and we have saints that have been speaking to us through the ages to move away from eating a disorderly diet. He causeth the grass to grow for the cattle, and herb for the service of man, that he may bring out of the earth and wine that maketh glad the heart of man, and oil to make his face shine, and bread which strengtheneth man’s heart.